Designing with the word "play" in children products seems to spur interesting memories as my process created a spontaneous array of unique shapes and form. Though initially, my design approach was to maximize the structural integrity of plywood where layering of thin veneer is touted for minimal warpage, high shear strength and evocative appearance (as well, I wanted the joints to be embed in the CNC construction process in effort to reduce manufacturing costs and increase productivity). However, many iterations later, I felt emotional characteristics needed to take root into the design. As a result, raising memories of being a child, for example, smelling chocolate chip cookies from the oven, having recess and playing in the rain and scheduling sleepovers with friends held significant value that personified my final product. 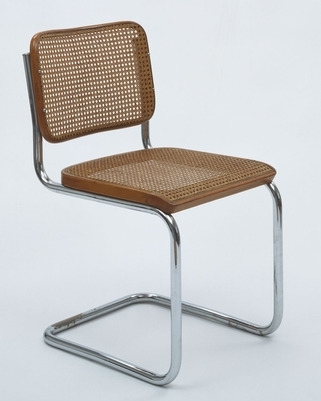 As a kid growing up reading Calvin and Hobbes comic strips to later admiring Marcel Breur and his iconic B32 cantilever chair, I would have always wanted to sit on a chair that had characteristics of a sleigh where creative impulses compel me to push, lift and pull as part of everyday behavior. When I observe kids role play like serving tea, telling stories to their stuff animal friends or even read a favorite book, I recognize tangible interaction with objects (through touch, sound, sight and smell) can foster an intimate experience that lasts a lifetime. And this is one of the main reasons why I largely choose wood in my projects as it is not only a beautiful material to work with, but that it also possesses a natural and pleasant energy that people can interact, relate and inadvertently coincide with. Older PostOur new location @ Makerlabs!